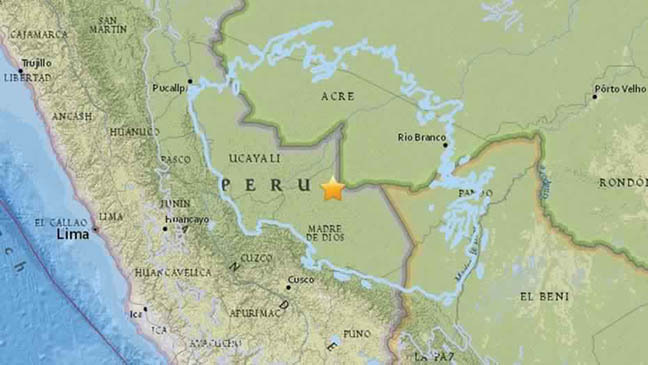 A 7.1-magnitude earthquake today has struck eastern Peru, close to its borders with Bolivia and Brazil on Friday morning, the U.S. Geological Survey reported. The earthquake today was recorded at 4:04 a.m. local time at a depth of 378 miles. The epicenter was 83 miles west of the Peruvian village of Inapari and 140 miles west of the Bolivian city of Cobija. In 2001, at least 74 people were killed after an 8.1 magnitude earthquake today shook southern Peru and triggered a tsunami, the U.K.'s Express reported. Earlier this week, a 7.0 magnitude earthquake today shook Venezuela Tuesday, the USGS reported.